Riviera double or twin bedded room with en suite bathroom, TV & radio, complimentary tea & coffee, complimentary toiletries, direct dial telephone, free WiFi and hairdryers in some rooms. All rooms are non smoking. These rooms are more spacious than our standard rooms, and have a better outlook. Please indicate bed preference when booking. (View picture is an example only, exact view may vary depending on location of each bedroom). 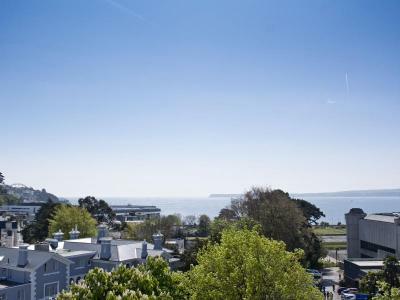 A small and stylish Torquay Hotel, with stunning views across Torbay. We are located a short walk from the nearest beach, attractive harbour and town centre. 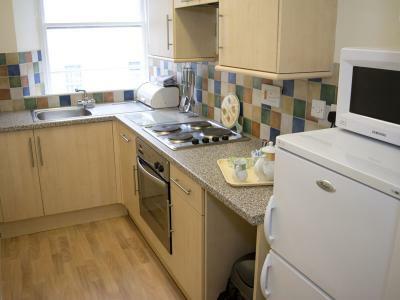 1 bedroom apartment with double and single beds in the bedroom plus a double sofa bed in the lounge and fully fitted kitchen with full size cooked, fridge and microwave. Apartments have TV & radio, direct-dial telephone, hairdryer and free WiFi. Linen & towels are included. High chairs and cots are available upon request. 2 bedroom apartment with double bed in the first bedroom and single bed or bunk beds in the second bedroom plus a double sofa bed in the lounge and fully fitted kitchen with full size cooked, fridge and microwave. 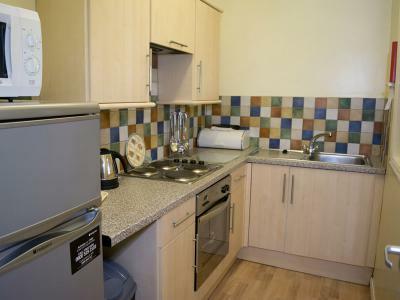 Apartments have TV & radio, direct-dial telephone, hairdryer and free WiFi. Linen & towels are included. High chairs and cots are available upon request.